General Use. Edited by Wayne Leupold. Organ - Method or Collection. 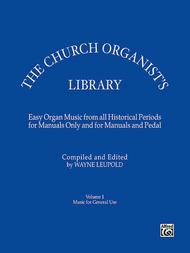 Easy organ Music from all historical periods for manuals only and for manuals and pedals. Sacred. Collection. 100 pages. Alfred Music #00-DM00239. Published by Alfred Music (AP.DM00239). ISBN 0769242456. 9x12 inches. English. 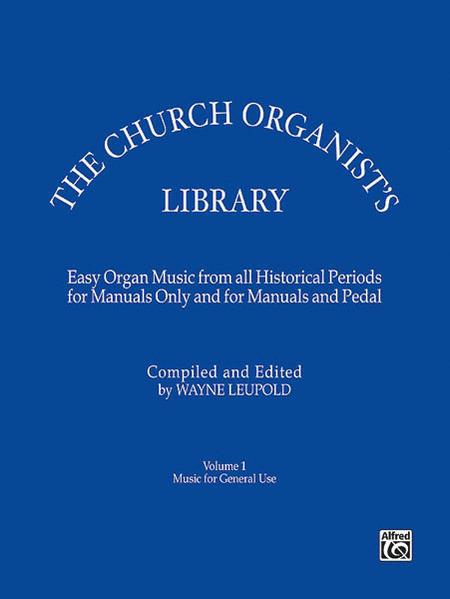 THE CHURCH ORGANIST'S LIBRARY is a general-use anthology containing easy organ music from all historical periods primarily for manual only, and for manuals with easy pedal. Urtext editions are used whenever possible. The music is presented to show what the composer wrote and what was published in the first edition. Any editorial suggestions, additions, or alterations are enclosed in brackets and/or indicated by footnotes. THE CHURCH ORGANIST'S LIBRARY contains works previously published in THE ORGANIST'S COMPANION. This is a very usable collection of organ music. It is readily sight read and can come in handy if something is needed quickly. Many of the selections, however, were contained in a few of my other collections. am very pleased with this book. The selections in this book provide a wide array of organ harmonies and rhythms. They are pleasant to listen to and can be practiced to perfection in a relatively short time. Highly recommended for the traditional worship service or mass. Nice selections. Enough variety for quick needs or some more challenging. Great collection for the Church Organist or Keyboardist who needs ' Fillers " for all types of Church services. 23 of 45 people found this review helpful.